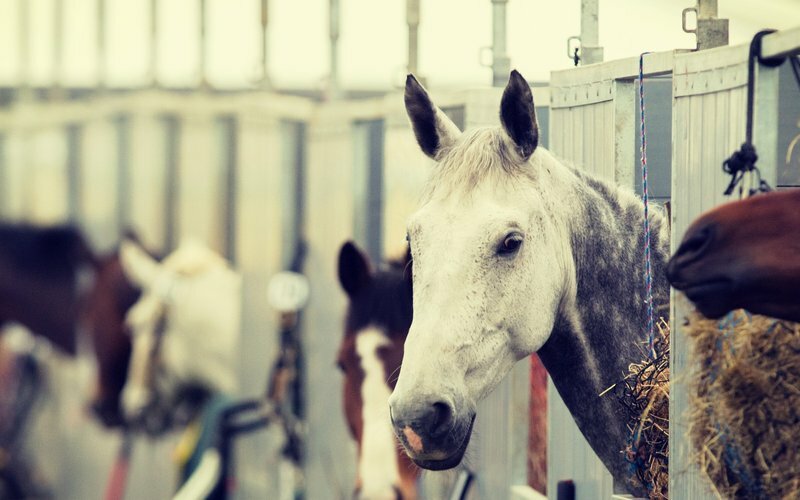 Winter is setting in and with shorter days and wetter, cooler weather many horses will typically spend more time stabled over the next few months, so what can we do to ensure they stay healthy and happy? Keep stabled horses in a routine – they are creatures of habit and like to do things at the same time every day. Feed forage to keep them occupied and maintain a healthy digestive system. Exercise is important for a horse’s brain. Time spent going on the walker on top of their work splits up their day. With stressful types, fit a mirror in their stable which can reduce separation anxiety, and keep a radio on at a low volume so they don’t feel alone. Use small-holed haynets for stabled horses to slow down their consumption of forage and make it last longer. Make sure your horse leaves his stable for at least an hour a day. Ensure he has plenty of company and can see other horses stabled nearby, and try stable toys such as treat balls or hang vegetables from the stable rafters to keep him entertained. A warming mash can be given to horses alongside their regular feed to warm up after cold days out. It can also add calories for those horses that are prone to losing condition over the winter. Feeding and watering horses from the ground can aid respiratory health because they lower their head and neck to open their airways. Feed good quality hay or haylage and soak or steam if necessary to reduce dust spores. Cut down on stable dust by using good quality and dust-free bedding. Ensure the stables are well-ventilated and that the urine-soaked bedding is removed daily. Use anti-fungal hoof oil inside and out on stabled horse’s hooves to prevent nasty infections occurring. Pick out their feet daily to remove any dirty bedding. Ensure your horse’s bedding is clean and deep. Apply a daily moisturising hoof application to prevent the hooves drying out and keep them well trimmed and shod. Regular grooming and feeding a balanced diet is key to a good coat. Check the weather regularly and rug your horse accordingly. Feed oil, which promotes a shiny coat. Bath the horses where possible on sunny winter days to stop the build up of grease, and regularly wash their base rugs. Put your horse in a chest bib to stop the rugs rubbing their shoulders. When grooming clipped horses, use a hot cloth with baby or pig oil to remove the grease and scum, and take their rugs off daily to check their condition. Feed a high oil and fibre diet to keep condition. Feed forage to keep the gut moving, alongside a quality diet fed according to the horse’s workload. Consider feeding a supplement to support the digestive system and ensure your horse is getting the appropriate vitamins and minerals. Keep feed wet where possible as it’s easier to digest. Ensure your horse has access to clean, fresh water at all times. Ensure they get regular walks out and exercise to increase their circulation. Keep their legs clean through grooming, and stable bandage at night to reduce filling. Don’t always wash your horse’s legs as this can increase the likelihood of mud fever. Sometimes it’s better to allow the mud to dry and then brush it off, and always towel dry legs after they have been washed.